Note: The Dietetics specialization is available only to Registered Dietitians (RD) or those eligible for registration exam. For Financial Consideration: March 15 for Fall. October 15 for Spring. Otherwise: Rolling admissions, contact the department for more information. The Department of Nutrition and Health Sciences is internationally recognized for its research, teaching, and outreach programs. Our classrooms and research laboratories are state-of-the-art and every graduate student is matched with an adviser whose expertise matches the student's career interests. Our Department offers research-based degrees in several diverse areas of study: Biochemical and Molecular Nutrition (Ph.D., M.S. ); Community Nutrition and Health Promotion (Ph.D., M.S. ); Exercise Physiology (Ph.D.); Food Literacy, Quality and Safety (Ph.D., M.S. ); and Hospitality Management (M.S.). In addition, students can earn a non-research master's degree (M.S. without thesis) in Dietetics (RD required); Nutrition and Exercise; or Community Nutrition and Health Promotion. 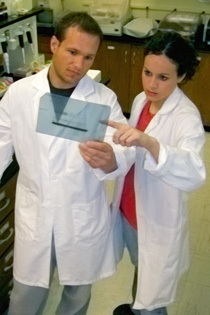 Because of the diversity of degree programs offered through the Department of Nutrition and Health Sciences and the Nutrition Interdepartmental program, students are encouraged to refer to the Nutrition and Health Sciences website to learn more about areas of study and degree programs, admission requirements, and step-by-step instructions on how to apply. For additional details check out the dept./program website: Nutrition and Health Sciences.